Wisdom Teeth: Are they “leftovers” from Evolution? Our better understanding of the complex teeth-jaw relationship has revealed this explanation is far too simplistic. Research now indicates that the reasons for most third molar problems today are not due to evolutionary changes but other reasons. These reasons include a change from a course abrasive diet to a soft western diet, lack of proper dental care, and genetic factors possibly including mutations. Common past dental practice was a tendency to routinely remove wisdom teeth. Recent empirical research has concluded that this practice is unwise. Third molars in general should be left alone unless a problem develops and then they should be treated as any other teeth. At times removal is required, but appropriate efforts to deal with problem teeth should be implemented before resorting to their extraction. These developments have led to a better understanding of wisdom teeth that have changed the practice of dentistry. In fact, in an article titled, “The Prophylactic Extraction of Third Molars: A Public Health Hazard,” Dr. Jay W. Friedman points out that wisdom tooth extraction (a $3 billion-dollar enterprise) should not be the default practice for most individuals, but should be only done on a case-by-case basis. Dr. Friedman argues: “… more than 11 million patient days of ‘standard discomfort or disability’—pain, swelling, bruising, and malaise—result postoperatively, and more than 11,000 people suffer permanent paresthesia—numbness of the lip, tongue, and cheek—as a consequence of nerve injury during the surgery. At least two thirds of these extractions, associated costs, and injuries are unnecessary, constituting a silent epidemic of iatrogenic injury that afflicts tens of thousands of people with lifelong discomfort and disability.” He concludes by stating, “Avoidance of prophylactic extraction of third molars can prevent this public health hazard.” For many of the same reasons, the UK even stopped routinely removing wisdom teeth (without solid evidence of required removal) in 1998, after a study at the University of York concluded that there was no scientific evidence to support it. People groups vary by a number of factors: skin color, hair color and type, eye shape, body size and shapes, and yes, even wisdom teeth. In fact, some people groups (e.g., Mexican Indians) don’t even typically erupt wisdom teeth! On the other hand, nearly 100% of indigenous Tasmanians fully grow in their wisdom teeth. Other people groups are in-between these two extremes (see Figure 1). Figure 1. Global distribution of prevalence of third molar Agenesis (not growing wisdom teeth). Figure 1 shows a wide variability between various people groups with respect to the percentage of people who don’t grow in their wisdom teeth. One study with 2,482 people also revealed that different people groups even grow in their wisdom teeth at different stages of maturity, with the German population in the middle in terms of the age of wisdom tooth eruption, South Africans the fastest, and Japanese the slowest. Are some of these people groups more or less “evolved” than others? From a Biblical Creation standpoint, certainly not! They do, however, vary on dietary history, industrialization, food types and production methods (especially in the past), and other characteristics by which people groups sometimes vary. Orthodontist John Cuozzo has studied this topic extensively in both “modern” humans and Neanderthal fossils. Because Neanderthals had larger brains and jaws than humans (by 10% and 15%, they had plenty of space for their wisdom teeth. Because evolutionists place Neanderthals in the distant lineage of “modern” humans, have humans been “devolving” (by having smaller brains and less room for growing wisdom teeth), or just changing within the pre-engineered adaptability designed by God. This entry was posted in Uncategorized on October 26, 2018 by cl311064769. Evolutionists from Darwin onward have claimed that the human body is a ‘museum’ housing many useless “leftover” parts from our evolutionary past.1 These parts, called “vestigial organs,” are believed to have once served functional purposes in our evolutionary ancestors, but these functions have since been lost due to evolution. Some of the most popular examples of “vestigial organs” include the so-called “tailbone,” believed by some to be a leftover tail; the appendix. supposedly a relic from the digestive system of our plant-eating ancestors; and wisdom teeth, which the long, jutting jaws of our ape-like ancestors could accommodate, but are often prevented from growing correctly in short-faced humans. But the truth is that none of these are really ‘useless’ leftovers! All of them serve a designed purpose in our bodies! Wisdom teeth, like the appendix, have a Fall-caused tendency to degenerate and cause problems in life, but just because an organ can cause problems doesn’t make it useless or a ‘bad design’! While some people’s wisdom teeth never develop, others simply do not have enough room in their jaws for the teeth to grow, so they become ‘impacted,’ meaning that they are blocked from growing into place by the other teeth. However, when there is enough room for them, wisdom teeth function as a perfectly-good set of third molars.3 It may be that God designed humans with these teeth to be used in chewing vegetation (man’s original diet, cf. Genesis 1:29). In the late 19th century, one evolutionist named Robert Wiedersheim put together a list of 86 supposed ‘vestigial’ organs, which he believed were evidence of evolution. However, every one of these supposed ‘leftovers’ have since been shown to have a purpose in our bodies1—exactly what we would expect to find if our bodies were created by an all-wise Creator God! Video – Vestigial Organs—Evidence for Evolution? 1Menton, David. 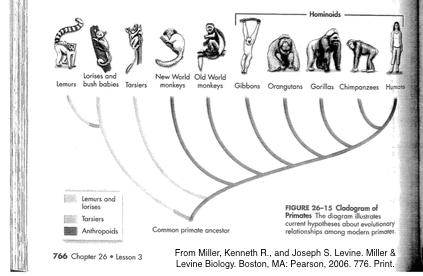 “Vestigial Organs—Evidence for Evolution?” Answers in Genesis. Answers in Genesis, 7 July 2014. Web. 29 Dec. 2015. <https://answersingenesis.org/human-body/vestigial-organs/vestigial-organs-evidence-for-evolution/>. 2Bergman, Jerry. “Chapter 9: Vestigial Organs” in Dan Biddle, ed., Creation v. Evolution. 2015. Genesis Apologetics, Inc. Available here: https://genesisapologetics.com/wp-content/uploads/sites/592/2015/12/Creation_v._Evolution_20161.pdf. 3DeWitt, David. “Setting the Record Straight on Vestigial Organs.” Answers in Genesis. Answers in Genesis, 28 May 2008. Web. 29 Dec. 2015. <https://answersingenesis.org/human-body/vestigial-organs/setting-the-record-straight-on-vestigial-organs/>. This entry was posted in Uncategorized on January 26, 2016 by caleblepore. Over the past few months, as we have been looking at the supposed evidence for human evolution, we have seen how the evolutionary story of our origins devalues human life by making us little more than animals. On the other hand, we have also seen how the Bible’s account of origins gives great meaning and value to our lives, since it tells us that we are made in the image of our Creator. The amazing truth that we learn from the Bible is that God didn’t just create us; He also cares for us deeply, so much so that He entered into His own creation to become “a little lower than the heavenly beings,” to provide a way of salvation for His beloved creatures. Image credit: Answers in Genesis. What makes human beings truly special? In addition to being the only creatures created in God’s image, the only creature that God ever became in order to redeem is…a human being! God didn’t ever take on the flesh of a chimpanzee, a gorilla, “Lucy,” or any other creature; just human flesh! We have all broken God’s commands—we’ve lied, stolen, had hateful thoughts—all of which God has seen and will judge. The penalty for sin is having God’s righteous wrath poured out on us in Hell, but the good news of Christmas is that God has provided us with a substitute. God sent His Son, Jesus, to earth to be born as a man, to live a sinless life, and to die on the Cross as the perfect, spotless sacrifice for sin. We broke God’s law, but Jesus paid our fine. Three days later, He was raised to life again, and now He offers you the forgiveness of all your sins and the gift of eternal life. How can you have your sins forgiven and receive the gift of eternal life? According to the Bible, you must repent (meaning to turn from your sins) and put your trust in Jesus for salvation. As Jesus explains in John 3:16, “For God so loved the world, that he gave his only Son, that whoever believes in him should not perish but have eternal life.” Have you repented and trusted in Jesus as your Savior? If not, make this the year that you discover the true meaning of Christmas and become a member of God’s family! ~ Merry Christmas from Genesis Apologetics! Top image credit: Answers in Genesis. This entry was posted in Uncategorized on December 24, 2015 by cl311064769. Second only to dinosaurs, cavemen are probably the most popular and mysterious of all so-called ‘prehistoric’ life. The popularity of the caveman has landed him roles in movies, cartoons, and TV commercials, usually playing the part of the bumbling brute who just doesn’t understand how life works in the modern world. 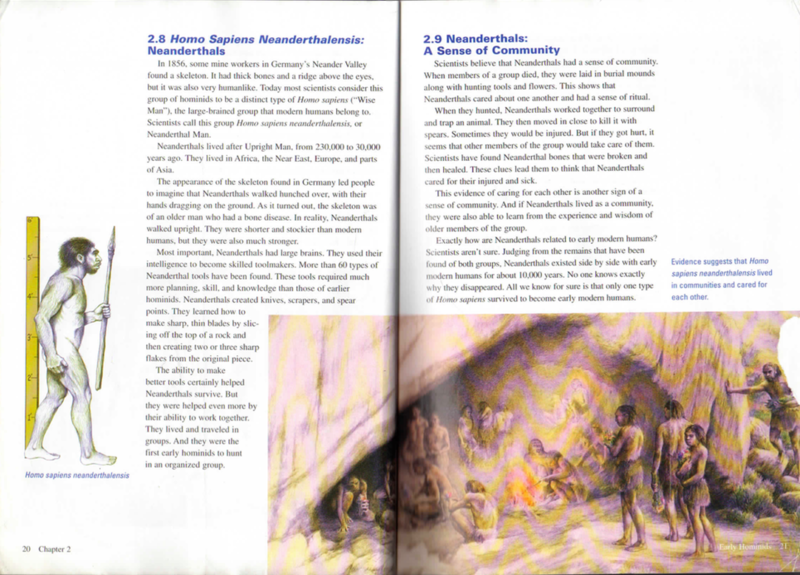 Neanderthal man, as he appears on pages 20-21 of 6th grade California textbook, History Alive! The Ancient World. Think about it this way: If your family was forced to flee from your home to a desolate wilderness, how would you survive? You might be able to use your electronic devices (smart phones, tablets) and tools (pocketknives, flashlights) for a while, but eventually, they would die or wear out. You probably wouldn’t have much food with you, your clothes would wear out, and you would need to find shelter from the elements. What would you do? You would have to use what’s available to meet your needs! After the Tower of Babel event recorded in Genesis 11, this is exactly what happened to all the families of the earth. When God saw the rebellion of mankind in refusing to obey His command to spread out and fill the earth, He caused the languages of the people to be confused, halting the city’s construction and scattering all peoples across the whole earth. No longer having the ability to communicate with other people groups, or access to the technology used to build the city, people had to survive on what was available. That’s where ‘cavemen’ come in. Some families, driven by the harsh post-Flood environment, may have used caves as temporary shelters or burial sites for their relatives.2 Today, in these caves we find a silent testimony to the fully humanity of their ancient inhabitants, who were descendants of Adam and Eve just like you and me. Fossils and artifacts from the Neanderthal ‘cave’ people show us that they crafted musical instruments, sophisticated stone tools, and jewelry, cooked, used cosmetics, cared for their injured, and held ritual burials; all things that only people can do.1,3,4 DNA from Neanderthal bones has also shown us that they are, in fact, our blood relatives,5 and bones from an Israeli cave have further revealed that Neanderthals had families with so-called ‘modern humans.’6 This evidence has led scientists away from the outdated, ‘ape-ish’ picture of Neanderthals to accepting that they were simply, “a distinct type of Homo sapiens…, the large brained group that modern humans belong to.”1 The pictures below illustrate how dramatically the perception of Neanderthal man has changed over the last century. John Gurche (2010). Source: Wikipedia. 2Ham, Ken. “The Only Missing Link—It’s Spiritual.” Answers Magazine. Answers in Genesis, 1 Apr. 2012. Web. 16 Nov. 2015. <https://answersingenesis.org/missing-links/the-only-missing-link-its-spiritual/>. 3Wieland, Carl. 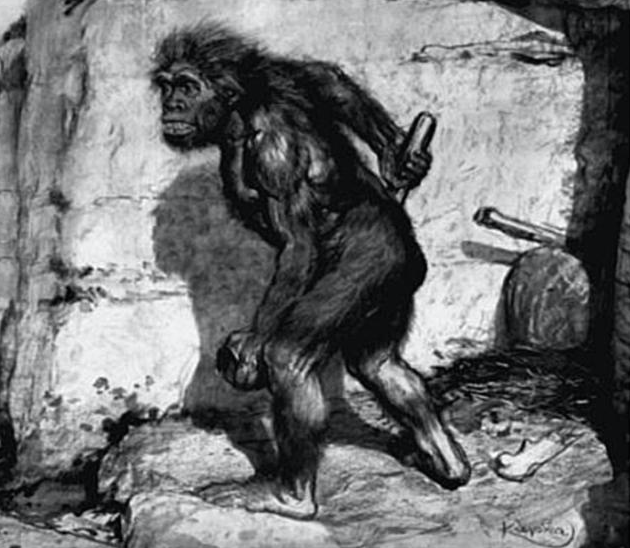 “Making Sense of ‘apeman’ Claims.” Creation.com. Creation Ministries International, n.d. Web. 16 Nov. 2015. <http://creation.com/apeman>. 4Menton, David, and John UpChurch. “Who Were Cavemen?” Answers Magazine. Answers in Genesis, 1 Apr. 2012. Web. 16 Nov. 2015. <https://answersingenesis.org/human-evolution/cavemen/who-were-cavemen/>. 5Purdom, Georgia. “How Are Cavemen Different?” Answers Magazine. Answers in Genesis, 1 Apr. 2012. Web. 16 Nov. 2015. <https://answersingenesis.org/human-evolution/cavemen/how-are-cavemen-different/>. 6Lubenow, Marvin. 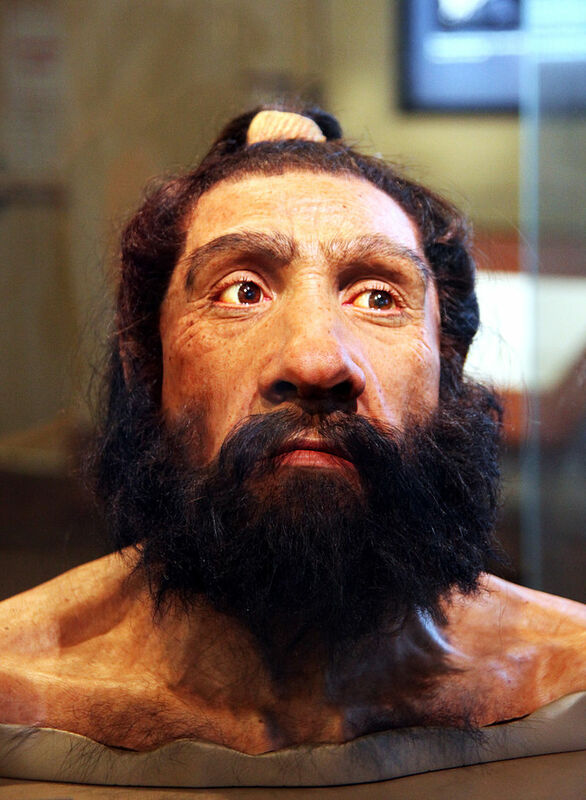 “The Neandertals: Our Worthy Ancestors, Part II.” Answers in Genesis, 11 Apr. 2007. Web. 16 Nov. 2015. 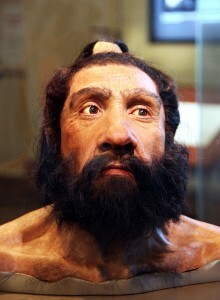 <https://answersingenesis.org/human-evolution/neanderthal/the-neandertals-our-worthy-ancestors-part-ii/>. This entry was posted in Human Evolution and tagged ancient history, Caveman, fossils, human evolution, jr. high on November 21, 2015 by cl311064769. Last week was very busy for our Genesis Apologetics video team! From Monday to Friday, the Roy (Creation Quest) and Justice (Awesome Science Media) families were hard at work directing and recording all 12 episodes of our video outreach series refuting the 11 pillars of evolution teaching in public school textbooks. Our actors, John and Madyson, did an awesome job bringing the scripts to life with their incredible acting skills. We have been blown away by how the Lord has graciously provided, brought all of the people involved together, and caused this whole last filming week to work together for His glory! We are so excited to see how the Lord will use this project to reach public school students across our state and nation with the truth of creation. As this project goes into production, will you please join with us in prayer, that the Lord would use this project for His glory and to open the eyes of young people to the truth of creation, and that He would use them to reach their friends and families? This entry was posted in Uncategorized on October 28, 2015 by cl311064769. Depiction of ‘hominid’ Homo habilis from 6th grade California textbook, History Alive! The Ancient World, TCI, 2004, p. 16-17. However, the track-record of evolutionary human origins research should prompt us to question the story we are currently being told about our ancestors in popular-science outlets like textbooks, magazines, museums, and TV shows. One may respond by pointing out that science is self-correcting, and that the Piltdown Man fraud was eventually exposed. Although this is ideally the case, there are two factors inherent in the search for human origins that inevitably lead to the making of numerous and serious errors, in some cases lasting for generations. 1Frey, Wendy, John Bergez, and Amy Joseph. History Alive! : The Ancient World. Palo Alto, CA: Teachers’ Curriculum Institute, 2004. 5-22. Print. 2Wieland, Carl, Don Batten, Robert W. Carter, Jonathan D. Sarfati, Emil Silvestru, Tas Walker, James F. A. Mason, John Hartnett, David Catchpoole, and Mark Harwood. “Chapter 4: The Fossil Record.” Evolution’s Achilles’ Heels. Powder Springs, GA: Creation Book, 2014. 146-148. Print. 3Dailymail.com, Ellie Zolfagharifard For. “The 1.85 Million-year-old Little Finger Bone That Could Rewrite Human Evolution: Find Suggests Previously Unknown ‘giant’ Ancestors That May Have Used Tools.” Mail Online. Associated Newspapers, 19 Aug. 2015. Web. 05 Sept. 2015. 4David Pilbeam, quoted in Richard E. Leakey, The Making of Mankind. London: Michael Joseph, 1981. 43. Print. 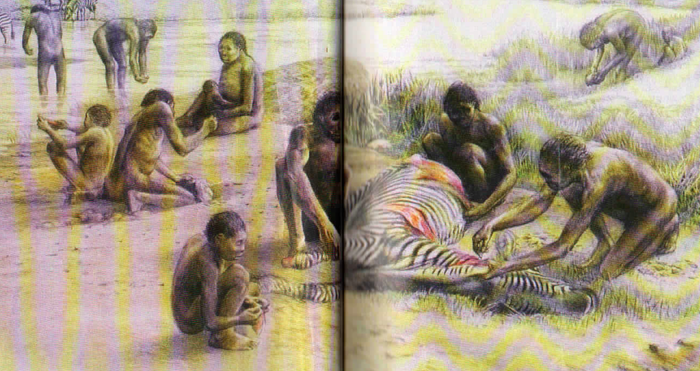 5Henry Gee, “Paleontology: Return to the planet of the apes.” Nature, Vol. 412, 12 July 2001, p. 131. 6Wieland, et al. Evolution’s Achilles’ Heels. 146-148. 7Enigma Man: A Stone Age Mystery, Australian TV documentary. See Grigg, R., Enigma Man: A Stone-age Mystery, July 2014. 8Marvin Lubenow, Bones of Contention (Grand Rapids, MI: Baker Books, 1992): 86-99. 10“Ida (Darwinius Masillae): The Real Story of This “Scientific Breakthrough”” Answers in Genesis. Answers in Genesis, 21 May 2009. Web. 11 Oct. 2015. <https://answersingenesis.org/missing-links/ida-darwinius-masillae-real-story/>. 11Miller, Kenneth R., and Joseph S. Levine. Miller & Levine Biology. Boston, MA: Pearson, 2006. 770. Print. This entry was posted in Human Evolution on October 14, 2015 by cl311064769. Did you know that public school students in California are taught that they are cousins of gorillas…starting in 6th grade? 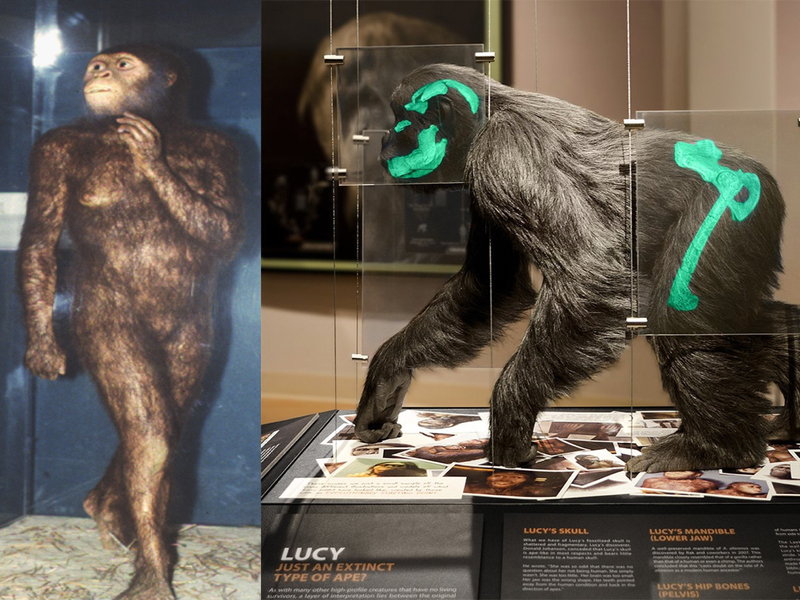 “Lucy” (Australopithecus afarensis) as she appears on pages 14-15 of 6th grade California textbook History Alive! The Ancient World. Human origins is by-far the hottest point of controversy in the origins debate—and for a good reason. Meaning and morality depend on where we came from and who (or what) made us. If God created us, our meaning and standard of right and wrong come from Him, but if evolution is true, then we are nothing more than animals with a conscience, with no ultimate purpose or morality other than to simply survive and pass on our genes. Origin also determines destiny. According to Scripture, the only remedy to the sin and death brought into the world by our ancestor Adam is the atoning sacrifice of our blood-relative, Jesus Christ, the Last Adam. But if we are evolved animals, then there was no Fall of man, sin does not exist, death is not the result of sin, and there is no ultimate reason to our existence. You live only for yourself, and when you die, you are accountable to no one for your actions. Since most Christian students attend public school, this should be a cause for great concern. Scripture warns us to, “Beware lest anyone cheat you through philosophy and empty deceit, according to the tradition of men, according to the basic principles of the world, and not according to Christ.” (Colossians 2:8) How much more should we teach the next generation to do the same? Instead of allowing our students to be stolen by evolutionary ideas, we need to train them to be, “casting down arguments and every high thing that exalts itself against the knowledge of God, bringing every thought into captivity to the obedience of Christ.” (2 Corinthians 10:5) This is our mission at Genesis Apologetics: to equip parents, students, and youth pastors with tools to help them think critically and biblically about evolution. Is the search for man’s origin really an exact science? Was ‘Lucy’ really our great-great grandma? 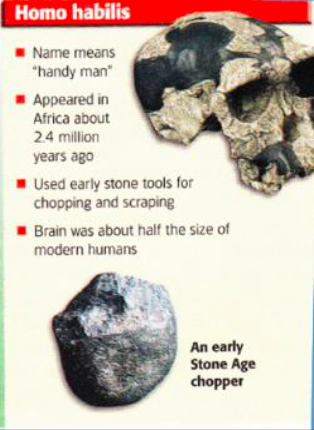 Was Homo habilis really the first ‘handy-man’? Was Homo erectus really an ape-like brute? Does our body really have ‘leftover’ parts from evolution? Also, a full-length book by Genesis Apologetics researchers on human evolution is currently in the works, so stay tuned! 2Miller, Kenneth R., and Joseph S. Levine. Miller & Levine Biology. Boston, MA: Pearson, 2006. 766. Print. 3“Exploring Human Origins: What Does It Mean To Be Human?” Smithsonian Institute Human Origins Program. Smithsonian Institution, n.d. Web. 12 Sept. 2015. <http://humanorigins.si.edu/exhibit/human-origins-traveling-exhibit>. This entry was posted in Human Evolution on October 8, 2015 by cl311064769. Everybody loves fossils. In my experience, fossils are one of the best ways to captivate an audience. Unfortunately, fossils are almost always presented within the context of evolutionary ‘history.’ In fact, California public-school students in 7th and 10th grade are taught that fossils are a major ‘evidence’ for molecules-to-man evolution. Recently-sighted ‘crusty’ type of nautilus. Nautilus fossils are found in some of the supposedly ‘oldest’ rock layers, appearing essentially the same as their modern relatives; a classic example of a ‘living fossil.’ Image source: Smithsonian.com. Examples of ‘living fossils’ include dragonflies, horseshoe crabs, coelacanths (fish), crocodiles, tortoises, chambered nautilus, and many others.6 Living fossils are found in every part of the geologic column, a puzzle to evolutionists who maintain that evolution occurred over millions of years as a result of slow, gradual change. In fact, the only real change observed in the fossil record is variation. For example, although paleontologists observe incredible variety in size, shape and design patterns of fossil ammonites, they are all easily recognizable as ammonites; we do not find ammonites evolving into anything other than an ammonite. 1Coolidge-Stoltz, Elizabeth. Focus on California Life Science. Boston, MA: Pearson Prentice Hall, 2008. 240. Print. 2Many former-Darwinists, including members of the creation science and Intelligent Design movements, have been led to this conclusion. 3The position taken by Charles Darwin himself and those who favor a gradual account of evolution. 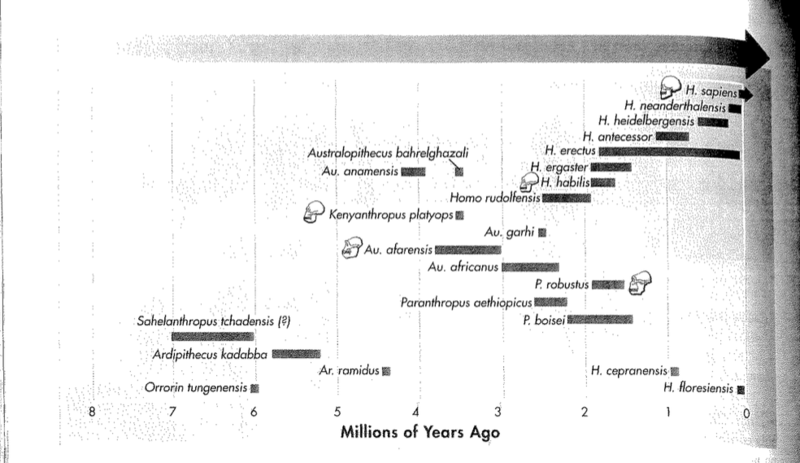 4A view of evolution known as punctuated equilibria, which was promoted by Harvard paleontologist Stephen Jay Gould. 5Werner, Carl, and Debbie Werner. Evolution: The Grand Experiment: The Quest for an Answer. Green Forest, AR: New Leaf, 2014. 86. Print. This entry was posted in Uncategorized on September 3, 2015 by cl311064769.